The curtain wall, commonly called curtain façade, is a non-load-bearing-wall that is essentially made of windows that are attached to the building’s structure with metal pieces. It’s not the same as a bay-window. Actually, the curtain wall generally takes a whole wall, like on skyscrapers and office blocks that we see everywhere in downtown Montreal. Can we paint curtain walls? Yes, façade walls can be painted. Obviously, we don’t paint the windows, but we do paint the pieces of metal that hold them. A good building painter also verifies the caulking condition and replace it if needed. How do we paint a curtain wall? The painting of curtain walls can be divided in several steps. Just like for any painting at heights project, the painting of a curtain wall is done with elevation equipment: elevating platform and safety harness. We will also need a pressure washing tool, a paint stripper, caulk, and a paint that is specially conceived for the type of substrate we will paint (it’s often aluminum, but sometimes iron), and of course, we will need brushes. If the team of painters need to install a vehicle (elevating platform or other) encroaches on the public road, no matter if it’s only on part of the sidewalk or on the street, it’s important to have an occupation license and to put orange traffic cones to avoid accidents. Moreover, if electrical wires are located near the lift or façade wall, it’s careful to cut the power. We will then proceed to pressure washing, which helps remove the dirt and old paint on the metal pieces. We finish the scraping manually, using a specially conceived paint stripper. This step will help the new paint adhering better to the pieces of metal. Seen the small dimensions of the metal pieces we want to paint, we prefer using paint brushes. If the metal is actually made of iron, we have the option to use electrostatic painting, which is less time-consuming. We always take time to sand the surface to remove the dripping and bumps before applying a new coat of paint. Finally, we apply a coat of finish paint before doing the final inspection to make sure the client will be satisfied. Please note that when the pieces are made of iron, we do a complete anticorrosion treatment to guarantee a great durability. Thus, the chosen paint is antirust. 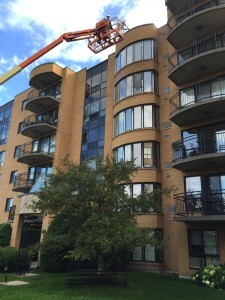 To learn more about exterior painting, please visit our page Exterior painting in Montreal. To make an appointment for a free quote, contact us.